Fans of Film Gear, this two-day coupon is for you! 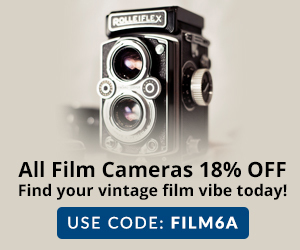 Running until Saturday at 11:59pm eastern time, KEH Camera is offering 18% off Film gear with coupon code FILM01A entered in their shopping cart. As usual, their shopping cart is the ultimate decider on what qualifies. A new week has arrived which means another round of featured USED Weekly Sales at KEH has been added. These are eligible for 25% off with permanent coupon KEHDEALS and continue until Friday night of the same week (eg Friday 10/6/17 in this case). More new arrivals at B&H Photo, as of the time of writing the Fuji GF670 Rangefinder Folding Camera is in-stock and ready to ship for $2199 with free standard shipping. This is a film camera, uses 120 & 220 Roll Film. It shoots 6×6 or 6×7cm formats. The lens is built-in (80mm f3.5 Fujinon). As of 2/22/17 recheck, this sold out… It’s an …instant party! The black color scheme of the Fuji Instax Mini 8 instant camera is bundled with 20 sheets of Instant Film, TOGETHER going for $45.43 with free shipping, sold and shipped by Amazon itself. Limit up to ten bundles per customer. The free shipping minimum for non-Prime members is now $35, so you can get free S&H on this without buying anything else. Film camera action now, of the instant kind even, the Fujifilm INSTAX Wide 300 is on sale for $85 with free shipping at B&H Photo and at Amazon by Amazon itself (limit ten per customer). The white color scheme of the Fujifilm Instax Mini 8 Instant Film Camera is on sale for $48 at Amazon by Amazon itself, and by B&H Photo with free shipping ~ as one of their latest Featured Sales. The Fujifilm instax WIDE 300 Instant Film Camera goes for $94~ at various sellers (eg amazon), but if you also need instant paper, it is bundled with a Twin Pack of Film Kit for $106.50 with free shipping at B&H Photo. Instant film cameras continue their mini resurgence (pun intended? ), as a brand new option from Fuji, the Fujfilm Instax Mini 26 + Rainbow Film Bundle is now in-stock and ready to ship for $70 in four different camera-body color-schemes at Amazon by Amazon itself. As the name suggests, these are film cameras that need Instax Mini style film. The Fujifilm Instax Wide 300 Instant Film Camera is currently on sale for $87.50 with free shipping by various at Amazon (including Amazon itself) and Adorama and B&H Photo. It looks like a price-match that propagated through. Speaking of instant cameras, the 30pk of Polaroid Zink photo paper goes for $13.55 at Amazon. Note this is for Polaroid cameras, not Fuji. The Fujifilm Instax Mini 8 Instant Film Camera in the yellow color scheme has dripped down a bit more, now going for $50 with free shipping with a limit of five units per customer at Amazon by Amazon itself. This lightning deal expired… Good until 3:25pm ET (or earlier if sold out), one of the is the Fujifilm Instax Mini 8 Instant Film Camera Pink + Fujifilm Instax Mini Instant Film Twin Pack (20 Sheets) + Pink PU leather Case With Photo Album 64 Pockets Pink Value Set Bundle (4 item) offered for $85 with free shipping. It is sold by a 3rd-party seller with the order fulfilled by Amazon. The price before the sale was $100 when we posted the schedule last night. It is 64% claimed as of 1:03pm ET. Instant action now, some of the many colors of the Fujifilm Instax Mini 8 Instant Film Camera (yellow, white, pink) are on sale for $53 with free shipping with a limit of five units per customer at Amazon by Amazon itself. The instant film camera wave continues to grow. Now the Impossible I-1 Instant Film Camera is in-stock and ready to ship to your front door for $299 with free shipping from B&H Photo and Adorama and from the Impossible Project through Amazon (not Prime eligible; it ships directly from the Imp). Also among the longer-running Woot offers, good until 5/23/16 at 1am ET is a sale on Fuji Instax Mini 8 instant cameras. You have to pay attention to the listings of the three colors. The pink is in new condition with a 1-year warranty and goes for $50. The white is refurbished with a 90 day Woot warranty and goes for $50. The blue is refurbished with a 90 day Woot warranty and goes for $60. So Pretty in Pink is the best deal. Limit three units per color per customer. Shipping is $5 flat for everything you buy from Woot during a single calendar day in the central time zone. The Impossible Project i-1 instant film camera is now in-stock-ish from the Impossible Project website. You can purchase it right now with a shipping estimate of 1-2 weeks ($300 is the option without any film, the $350 and $400 prices include film with them). If you can wait, it will become available for pre-ordering on May 24 in 2016 at B&H Photo. One of the main (aka the ones that run all day long ~ unless they sellout) Amazon Gold Box Daily Deals is a sale on various Polaroid Snap Instant Digital Cameras. The camera-only goes for $100, while the bundle with a 50pk of 2×3 ZINK paper and pouch go for $113. Limit three per bundle per customer. I believe some colors sold-out since it went live, so don’t sleep on them. Offers end at 3am ET on Wednesday or earlier if sold out. The Fujifilm Instax Mini 70 Instant Film Camera in the yellow color option is on sale for $99 with free shipping at Amazon by Amazon itself. Limit five per customer. If yellow is not your color, the sale also includes the blue and white camera bodies that go for $100 each with a limit of five as well. A 3rd-party seller has them for the same price, so you can get more from them if you need more. TIP: this looks like it may be an automated Amazon price-match of the 3rd-party seller price, so it’s completely unpredictable how long this will last. The limit is three of each camera per customer. Shipping is $5 flat for everything you buy from Woot in April 2016, so if you already bought something, you won’t pay shipping again in April 2016. This may be an experiment to try a monthly/annual membership or a competitive counter to the $5 per month Meh.com MVP plan (they funnily call is VMP rather ironically!). We have a “mini” instant camera theme now, first with a real camera, and the next post below with an imaginary camera. The real instant camera is this, the Fujifilm Instax Mini 8 Instant Film Camera currently on sale for $49 with free shipping at Amazon by Amazon itself with a limit of five per customer. This is available in black, blue and pink at these prices. Adorama has a 48 Hour sale that among others it includes the Fujifilm INSTAX Wide 300 Instant Film Camera bundled with a 20pk of Instax Wide Instant Color Print Film, all together for $100 with free shipping. Film is making a solid comeback, vinyl is making a solid comeback, when are the flip phones going to make their comeback? The answer to that I do not know, but I do know that the Fujifilm Fujichrome Velvia 100 Color Slide Film ISO 100 (35mm, 36 exposures) is on sale for $10.64 with a limit of ten per customer at Amazon by Amazon itself. The usual free shipping terms apply (Prime membership or $35+ order). An instant camera is more fun when you have more film 🙂 So with that in mind, Adorama is bundling the FujiFilm Instax Mini 8 Camera (available in multiple colorful pastel-y colors) with the Daylight Film Twin Pack (20 exposures) for $75 with free shipping. At the bottom of the list there, you will also find the Fujifilm INSTAX Wide 300 Instant Film Camera bundled with the Instax Wide Instant Color Print Film for $100 with free shipping. You can find them all at the Adorama Instax Sales. Offers end by 12/25/15 at 11:59pm ET.